Grand Rapids paraeducator Jason Heemstra used to be the sort of union member who questioned and complained without getting involved. Maybe that’s why he’s such an effective advocate for MEA today. 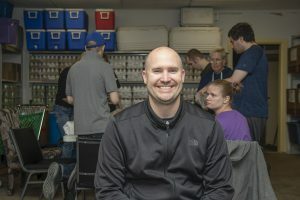 Paraeducator Jason Heemstra, who works with young adults who have autism, recently took on leadership and organizing roles in his local association. Two years ago, Heemstra quit grousing and stepped up to act in his ESP unit. He ran for building representative and won, then got appointed temporary treasurer after a resignation left the position open. This year he went a step further and joined 14 teachers and education support professionals as paid fellows in an organizing effort—Ed Summer—now in its second year, funded in part with a grant from NEA. The goal is to better connect MEA with new hires and non-members. “There’s strength in numbers, and trying to get more people motivated and involved is something that I enjoy doing,” Heemstra said. The Ed Summer fellows worked 20 hours per week over seven weeks in July and August reaching out to newly hired employees and potential members in their own schools and neighboring districts in 11 areas of the state. The program aims to build membership through one-on-one conversations, presentations at new hire orientations, and social connection at welcome events. The fellows conducted all three types of outreach, said MEA Associate Executive Director Marcy Felegy. “We know there is no better opportunity to engage and advance the cause of protecting public education than member-to-member conversation,” Felegy said. A 14-year paraeducator who works with young adults who have autism, Heemstra was selected for the program because he had demonstrated success in building up his own unit—increasing membership by 14 percent simply by talking to people about what the union offers. He doesn’t pressure anyone to join but simply speaks, listens, and answers questions, he said. He starts with pocketbook issues: legal services, free education and life insurance, big discounts on a huge number of goods and services, such as restaurants, travel, new cars and electronics. He listens to people’s concerns and shares how the union allows school employees to work together to raise issues, address concerns, and solve problems—that members joining together can speak more forcefully by getting active in local, state, and national issues. The 15 fellows in the program were given goals to reach, and they have accomplished those and more, Felegy said. They exceeded the target of 1,500 one-on-one conversations, identified natural leaders in their buildings, and signed up 260 new members—125 percent of the goal. “Members connecting with members is how we bring together people’s personal reasons for why they do the work they do with the bigger picture—of making sure public education not only survives but turns the corner and starts thriving,” Felegy said. The Ed Summer program has offered the additional benefit of developing the next generation of leaders, Felegy noted. Claire Scislowicz became a fellow this summer after her second year of teaching Spanish and Language Arts at Rochester High School. She said it was a “no-brainer” for her to participate, because she is passionate about teaching and aware of MEA’s importance. Her father, Fran Scislowicz, was a Rochester teacher, coach, and MEA member for more than 30 years. “Dad always talked about the union and feeling supported by everyone there,” she said. In addition to her family history, Scislowicz is an MEA building representative who understands the ins and outs of what the union offers. “I was excited to learn more about our contract and how change is advocated for and initiated,” she said. Talking with her colleagues about their frustrations and concerns helped her get to know them better by walking a mile in their shoes, she said. That was especially true with new hires just starting their careers. “The one thing I love is giving back, so now that I’m in my third year—not that I’m super experienced—but I feel like I can offer some good advice to the new hires because I was just in their position,” she said. All local associations should be promoting more involvement of younger members, said Rochester Education Association President Doug Hill. Connecting early career educators with each other is powerful because of their shared experience, he said. 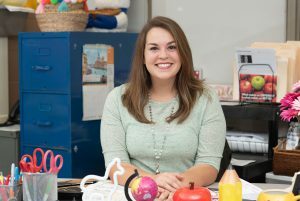 “Actively engaging our early-career educators empowers them and provides them a sense of belonging within the organization that allows them an opportunity to succeed,” Hill said. The experience has been “amazing,” Scislowicz said. At staff meetings in her building and district, newly hired teachers feel comfortable approaching her to ask for help about “random things,” such as how to use the copy machine. “I’m so much more approachable because they saw my face from the summer, and they know who I am, and they know they can talk to me,” she said. As part of her fellowship, Scislowicz gave a presentation about the union at the district’s new hire orientation. “A bunch of new people signed up, because they saw it was something they wanted to be a part of,” she said. She values the culture at Rochester High School, where “Everyone bonds together, even if they’re not in the same content area, whether they’re 54 or 24.” But Scislowicz worries about the growing teacher shortage and increasing demands on educators just starting out.